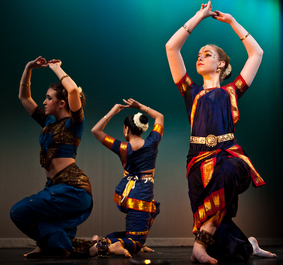 ~ Devi Dance Theater Youth ensemble is made up of ethnically diverse, talented young dancers who have have developed creativity, and discipline. Though young they have charmed audiences at well known dance festivals. ~ Artistic excellence on stage and qualities of human excellence off stage are equally realized in the youth ensemble. These dancers pursue 5 levels of defined Kuchipudi syllabus to attain technical mastery. * The implication of cyclic time as opposed to linear. * The dancer's relationship to the inner outer and physical space. * Reflect on dancer's skeletal framework and it's arcihitechtural possibilities in dance. * The roles of poetry, myth, and symbolism.